As a writer, I'm a reader of various genres--from mystery, thriller, and suspense to historical fiction and romance and, on occasion, mainstream. Each genre gives me a taste of the craft of writing from a number of excellent authors. One of my most recent favorite cozy mystery authors is friend and co-writer Marilyn Leach. At the age of nine, Marilyn wrote her first play withe a neighbor friend—a mystery—The Ghost and Mr. Giltwallet. She’s been writing in one form or another, hobby or livelihood, since then. As well as teaching art, she’s had the opportunity to co-author several plays that have been performed on both church and secular stages, as well as two screenplays. written works. A keen fan of Agatha Christie’s Miss Marple and David Cook’s Hetty Wainthropp series, Marilyn was inspired to write her Berdie Elliott Mystery Series, which takes place in a small English village where the vicar’s wife, Berdie Elliott, is the divine sleuth. 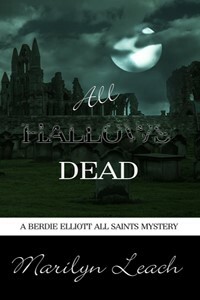 In her latest in the series, All Hallows Dead, when Berdie Elliott, vicar’s wife and sleuth extraordinaire, attends a church course with her husband in the North of England, she bumps into her former newspaper boss who calls upon her to investigate beguiling circumstances that spell murder. From the landed Cavendish family to the local pub’s manager, Criswell Abbey and its village are steeped in a centuries-old mystery. The legend of a departed churchman, a mysterious bell tower, England’s tangled history, a delayed marriage proposal, and a wily parrot all help Berdie to declare the truth in All Hallows Dead. Berdie Elliott and her best friend, Lillie Foxworth, often find themselves in hot water, and they’re not brewing tea. What I found is absolutely priceless. There’s….” Berdie stopped when she became aware of clip-clop steps in the nave. “Shh.” She put her index finger to her lips. “Why shush?” Lillie didn’t make her voice particularly quiet. The steps outside became louder. They were advancing toward the tower. Berdie held her breath. She realized instantly that whoever was on the other side of the door, was perhaps one who knew all the secrets of this place which could mean she and Lillie were in very real danger. Short autumn days and long blustery nights are just the season to read All Hallows Dead with a hot cup of tea close at hand. Cheers! At various times in a writer's life, we come across kindred spirits in surprising places. A kindred spirit is one who has the same view of life as you or with whom you share a common interest. I met such a couple at my church's 4th of July festivities. Hans and Lily Diehl are parents of a friend at church, and they had recently come back from touring the Waldensian Valleys of France and Italy. They hadn't known of Jamie and Alessandro's dramatic tale as it unfolds in my Waldensian Series before they visited the region, but they expressed the same fascination for the Waldensian story. But what so captivates our hearts about the Waldensians? I believe the Waldensian story mesmerizes us by the real-life drama of a people of such tenacious trust in their Savior that they would rather suffer persecution and martyrdom for centuries rather than deny the truths they held so dear. These truths were so entrenched in their hearts and minds that most could not imagine revoking them. They would defend the truth of the gospel to their deaths. It was the Waldensian's uncompromising faith in real-life that captured Jamie's heart in Light Out of Darkness and encouraged her to stand firm and face a formidable foe in Undaunted Valor. Her fictional story awakens in us a hope that we, too, might remain resolved when put to the test. At the same time, the Waldensian story terrifies and beckons us to ask the hard questions of ourselves in the same way Alessandro wrestled with trusting God in the hour of his trials. What would I do today, at this moment, if a soldier came to my door asking me to denounce my faith? What would you do? How will either of us be remembered by those who come after us? In the end, the real-life history of the Waldensians and the fictional drama carried out in Jamie and Alessandro's world reminds me of the challenge to people of faith given by the author in Hebrews. "Therefore, since we are surrounded by so great a cloud of witnesses ..." Will you and I be counted among them? The Waldensian Series is a contemporary Christian suspense series in which the characters find the courage to face their own fears based on the real-life drama of a Christian sect who stood firm for centuries and gained a place in history as a people of undaunted valor. For nature lovers, ski aficionados, travel enthusiasts, and history scholars, the French and Italian Alps offer some of the most spectacular scenery and outdoor recreation in Europe with its majestic mountain peaks, cascading waterfalls, unspoiled forests, and quaint villages. People visit to get away from the daily grind and rejuvenate their spirits. But when Alessandro Marianni's grandmother is kidnapped during a church conference in Chamonix, the same landscape becomes an ominour height to scale, and Jamie Holbrooke and her fiancé Alessandro have difficulty distinguishing between friend and foe on a race to find her. They will have to weather a rainstorm on a mountain trail, negotiate a dangerous waterfall, outmaneuver a car chase, defy an assassin's gun in their search. Will they find their beloved Luciana before it's too late, and who will die on the way to the finish line? Who can they trust? Where will Jamie find the courage to confront her adversaries? In this sequel to Light Out of Darkness, the answers will lay in unanticipated places and with unexpected allies and require Jamie to discover what means to trust God with Undaunted Valor. 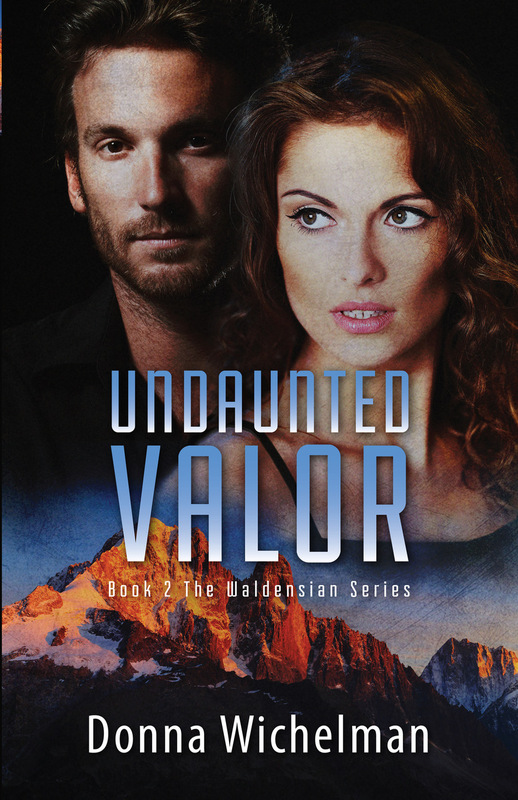 After my Christian suspense novel, Undaunted Valor, released in April this year, people asked me if I had actually visited the parts of Europe where Alessandro's Grandmother Luciana was kidnapped and held for ransom. My response always feels humbling, because I consider having gone to the Savoy region of France to do research on the book an enormous privilege. Yet the experience enabled me to write with an authenticity I would not have otherwise had. Research has been the backbone of much of my writing. I can't imagine writing any piece--fiction or nonfiction--without a sense of having a more intimate knowledge of the circumstance or place. In the beginning stages of outlining, I find the research fun, my mind stimulated by the possibilities for how the story can develop. What began as a foray into the unknown becomes a treasure trove of tenable opportunities for story and character. Halfway through Undaunted Valor, Alessandro has obtained intel that Luciana has been sequestered in a stone cottage in the mountains, but the exact location is unknown. Jamie and Alessandro have to hike a portion of the Glorious Return trail to find her, running into all sorts of snags they don't anticipate. Since I had followed portions of the ancient trail, I knew where I wanted to place the ruined stone cottage, and I added a rainstorm immediately upon their find of the hideout to add ambiance to the mood. Throughout the process of writing, many things came up I needed to research--the kind of gun appropriate for a situation, the wild animals common to the region, a 1940s style European kitchen. I didn't always know or remember the information I needed for a particular scene, but I could always research the virtual world and information on my computer. In fact, my car chase scene in the iconic ski village of Megève, France came from utilizing a satellite image of Google Maps. If you're a writer, reading this and feeling discouraged because you don't have the funds to travel, I encourage you. Your research is literally a click away. It's fun, stirs the imagination, and often provides just the right impetus to get you started. I know many people don't like to do the work of research, but I've discovered sometimes even the bunny trails lead to something I can use. If you're a writer and have been hit by writer's block or you're at a place where you need a new idea, move your computer mouse right now and click on Google. You'll be surprised by what you find. It might even be your own treasure trove of tenable opportunities! 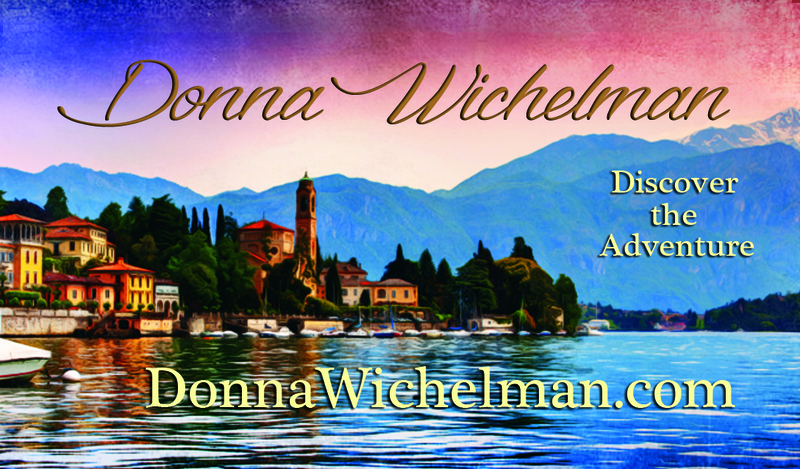 Donna Wichelman was a communications professional before writing full-time. She has authored short stories, essays and articles in various inspirational publications and lives her dream writing novels and screenplays. She and her husband work with teens at their local church in Fort Collins, Colorado. They travel, bike and kayak whenever their schedules allow. Writers: What Do We Feel About Our Writing? All this is to say that writing can often be like the blustery snow storm outside my window on this April day. When the clouds first move in and the impending weather appears ominous, I dread the driving winds and the bleak beginnings, and a cold harsh reality sets in that I must write something worth anybody’s time. I ask myself why I’m putting myself through this agony. Yet, when the winds have subsided and the sun comes out, and the snowflakes lay like billowy drifts of tiny multi-faceted diamonds, I’m warmed by the way the words sparkle with intricate beauty … if I’m lucky. Perhaps it’s the latter sentiment that compels me—the eternal hope that, if I’m lucky, at least two sentences will have gotten across in a way that captures the essence of all that matters and is worth reading. I believe God planted the desire in me to write from the moment I was conceived in my mother’s womb, since I've been writing from the first time I could put words to the page. Truth be told, I write because I believe God gave me a gift I should not squander. It's not about the money; most writers will never make a living at their work. It’s not about the fame; few authors reach that stature. Yet perhaps someday, if I’m very lucky, something of beauty will sparkle off the page, and your heart will be warmed as well as mine. For nature lovers, ski aficionados, travel enthusiasts and history scholars, the French Alps offer some of the most spectacular scenery and outdoor recreation in Europe with its majestic mountain peaks, cascading waterfalls, unspoiled forests and quaint villages. People visit to get away from the daily grind and rejuvenate their spirits. But when Alessandro Marianni's grandmother Luciana is kidnapped during a church conference in Chamonix, the same landscape becomes an ominous height to scale, and Jamie Holbrooke and her fiancé Alessandro have difficulty distinguishing between friend and foe on a race to find her. They will have to weather a rainstorm on a mountain trail, negotiate a dangerous waterfall, outmaneuver a car chase, and defy an assassin's gun in their search. Will they find their beloved Luciana before it's too late, and who will die on the way to the finish line? Who can they trust? Where will Jamie find the courage to confront her adversaries? In this sequel to Light Out of Darkness, the answers will lie in unanticipated places and with unexpected allies and require Jamie to discover what it means to trust God with undaunted valor. A prestigious art exhibition turns into a horrific spectacle when a murder sends an art curator and a professor on a hunt for a highly coveted stolen painting. Escaping a painful past in Cleveland, Ohio, Jamie Holbrooke flees to Milan, Italy as an art curator. But her past follows her during an evening stroll along Varenna’s shoreline walk when an assailant, who looks like her dead brother, presses a mysterious riddle into her hand. Still reeling from shock the next day, she discovers her long-time paragon, Dr. Alessandro Marianni, may have a link to the enigmatic riddle. Before she can discover the answers, their colleague falls prey to an assassin’s bullet. Convinced the riddle and murder are connected, Jamie and Alessandro risk their lives to uncover why an obscure painting has caught the attention of art critics and criminals alike. At stake is a two-thousand–year-old drama, unfolding in the contemporary world of the Northern Italian Alps. Will Jamie and Alessandro stop powerful organized crime figures before the painting is lost forever and with it a secret more valuable than the prized artwork? Will Jamie find the answers to help her reclaim her life again? She will need the courage to face her fears and the persevering faith of Dr. Alessandro Marianni to heal her wounded heart. How Are You Living Your Real-life Story? Last week, I shared a blog written by my friend Jane Choate titled Humbly Grateful or Grumbly Hateful. Her eloquently expressed thoughts roused in me a desire to write Bitter versus Better: Writing Stories that Touch the Human Spirit. Like my friend Jane, I experienced bullying during my primary and secondary school years. Bullying happens for a multitude of reasons. In my case, I was too fat. Though I had lost the weight by junior high school, the kids who I'd grown up with at school still teased me mercilessly. A young woman from my neighborhood physically and verbally abused me at the bus stop on a regular basis. The taunts hurt so much that one night I came home from school and stood in the shower with the hot water pouring over me, sobbing and calling out to God, Please God, never, ever let me be like them. Never let me ever be a person so vile and cruel and disgusting. I believe the night I wept before God, He set me on a journey for the rest of my life. Lest you think the journey has been easy, I correct that thought. The scars and personal baggage from that kind of abuse last into adulthood and don't go away overnight. Thank God, He's given me a lifetime to teach me how to love myself and others in healthier ways. Many of us have heard the adage, "Trials can make you bitter or better." Writing has become a way I can bring people along on this journey from bitter to better--from suffering and depravity to joy and redemption. Like Elphaba in Wicked, we can use our persecution at the hands of others as an excuse for becoming the Wicked Witch of the West. Or we can become like Jean Val Jean in Les Miserables who, after receiving mercy from a man of God, leaves behind his sufferings at the hands of an unjust jailer to redeem Cosette from a cruel and depraved innkeeper and his wife. Real life stories abound with the consequences of how our choices to become bitter or better influence the world for evil or good. Hitler and Stalin are extreme examples of childhood abuse. Yet Christian author Corrie Ten Boom experienced life in a concentration camp and became well-loved by the inmates for her kindnesses throughout their internment. As writers, we have the opportunity to show in story how choices to become bitter or better have consequences for evil or for good. As people, I believe how we live out our real-life stories has an even greater impact for the world. Have You Discovered the Treasure Beyond the Fuzzy Orbs? Before LASIK surgery at age forty, severe nearsightedness blinded my vision without corrective lenses. I only saw an advantage to this condition at Christmas when the tree went up with its strings of colorful bulbs. Without vision aids at night, the lights on the tree appeared as fuzzy orbs, blending together in a dazzling display of color. To be honest, I was hypnotized by it. Yet my distorted vision kept me from seeing more extraordinary treasures around the tree. With my lenses in place, I discovered ornaments friends and family had given us, invoking dear memories of people I loved. I found ornaments my husband and I had collected from places we’d visited around the world, summoning fond remembrances of our years together. I observed the Christ child in the manager, centering my focus on the truth of Christmas. Letting go of my distorted vision and putting on my lenses showed me the beauty, wonder, and joy beyond the fuzzy orbs. Like my blurred vision, writers of faith can be hypnotized by the fuzzy things of this temporal world, but those things are mere shadows or distortions of the extravagance God has lavished on us in Christ. Donning our corrective lenses allows us to view our writing journey in perspective. First and foremost, corrective lenses enable us to see the light of God’s promise of true joy today as well as the astonishing beauty and wonder of the future to come even if our journey as writers contains bumps in the road along the way. Then we understand that what we write doesn’t merely revolve around our own little worlds but requires us to reach beyond to something more extraordinary. We demand more of ourselves by continually honing our craft, accepting constructive criticism, and throwing away the chaff. We search for unique ways to tell our stories and entice our audience to embark on the journey of discovery with us. We dare to embrace the world of marketing our work in spite of timidity and self-consciousness. Yet we adjure ourselves to forgo foolish pride and go about the journey in humility and faith. Only by letting go of our distorted vision can we experience the treasures beyond the world of the fuzzy orbs. I invite you to fix your eyes on the prize that is set before you as you experience the world beyond the fuzzy orbs. 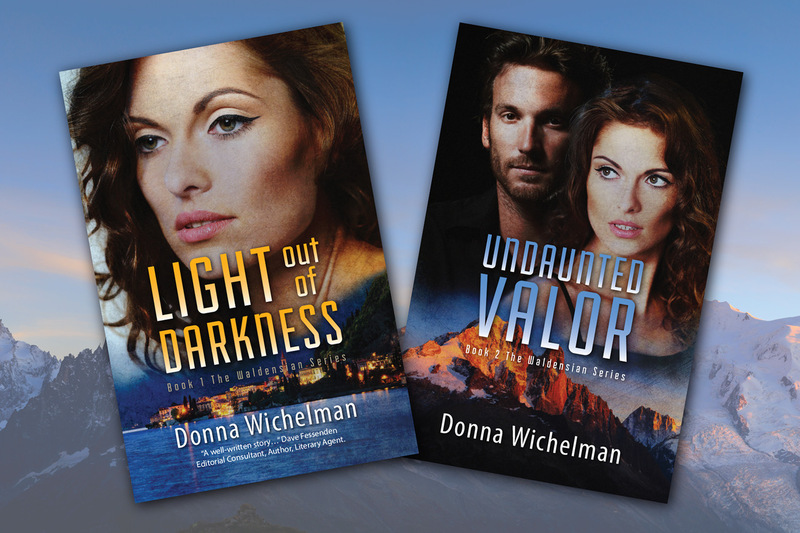 Post Script: I also invite you to visit my updated website at www.donnawichelman.com/books to get a preview of my newest book, Undaunted Valor. I will always remember the drizzly day I ambled Emily Brontë’s heather-dressed moors at age seventeen. As an American student in the United Kingdom writing a thesis on Wuthering Heights, my romantic spirit soared, savoring my chance encounter with an old gent, sporting a cap and a cane, whose family had known the Brontës. The experience sealed my desire to write. The first time an editor solicited a manuscript I had pitched, my heart danced. I knew it would be accepted and become a best seller. I’d be another Emily Brontë. Months later, I received a rejection letter in the mail with constructive notes and the editor’s good wishes. I felt crushed and never implemented the changes. Over the years, I’ve sold personal essays, short stories and devotionals. 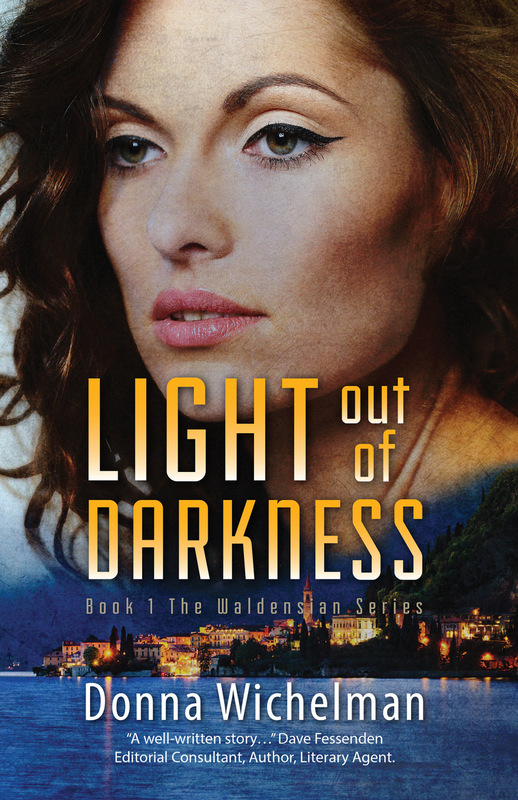 Two years ago, after an unsuccessful run with an agent, I self-published my first Christian suspense, Light Out of Darkness, which will see a reprint at the end of March along with the publication of the sequel Undaunted Valor on April 4th. You will hear more about that in the coming weeks. In spite of modest success, rejection has often made me think about giving up this seemingly hopeless cause. In time, I realized the onus was on me to hone my craft, never to be complacent about my work, to accept constructive criticism and throw out the chaff. Most important, I learned my value as a person doesn’t depend on whether my work gets accepted. I am much more than my writing. As a person of faith, my worth comes from God, not glory or fame. I write to bring people with me on a journey of joy, wonder and discovery. If I’ve touched one heart, if one morsel of truth encourages a soul, then I’ve done my job. I may not be Emily Brontë, but I wasn’t meant to be, and that’s honestly okay with me. The greatest advice I can give beginning authors is this: never stop learning your craft, but always remember where your worth as a person comes from.